Being one of the renowned names guided by hard-working and proficient personnel, we are involved in offering Expandable My Clear Bag. We are leading manufacturers and suppliers of dpaque f/c, in India. - N4 and F/C size. - Light weight 8 Highly durable. - Blue, Black and Gray color available. 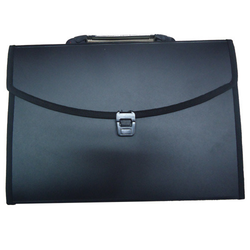 Praised by clients, we are presenting PP Expanding Bag to the valuable patrons at very reasonable price. Presented products are designed using best quality material. With an objective to stand high on all the demands of our patrons, we are engaged in presenting ExpandingButton Bag. We are presenting an excellent quality assortment of Plastic Confrence Holder.